or, You're using a $2000 camera to do what!? 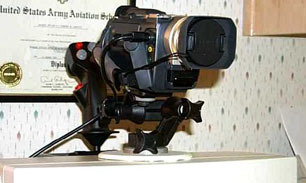 The camera mount is an old Bogen 3025 tripod head screwed to a nylon doorknob bumper plate from Home Depot. The whole thing is sticky taped (not too pretty) to the top of the monitor. The mount is adjustable, sturdy, and cost me $2.95. Subject: EUREKA! Video Conferencing Heaven! Oh, yeah! I just finished 3 Netmeeting video conferencing calls using my TRV900, and ALL THREE callers asked me right up front what kind of webcam I was using to send the quality image they were seeing! To make the situation even more enticing, the solution is a lot less money than I thought it would be. In my previous message, I indicated I would try a Dazzle DVC, a $200 analog-to-USB 2-way capture device with audio. Quite by accident, a co-worker mentioned that he was getting a pretty good live video image with his Sony TRV103 and the little brother of the Dazzle DVC, called the Dazzle Photo Maker. Dazzle's home page pitches the Dazzle Photo Maker (DPM) as a snapshot device, and has virtually no mention of it's use as a streaming video device. There IS a teaser that mentions Netmeeting is included with the DPM, although it actually isn't anymore. A thorough reading of the web pages on the entire Dazzle line reveals that the DPM is an analog-in-only device without the audio section it's big brother has. In short, it's an analog video capture device that accepts S-Video or video signals only. Short and sweet. It's uncontrolled signal runs whenever the camera is hooked up, delivering the sought after video conference signal. The mpeg editing software is missing, along with a few video album type apps. No matter what's missing, it works great as a device to utilize my TRV900 for video conferencing. The Dazzle DPM costs $100. The unit is the size of pack of cigarettes, finished in that translucent blue and clear look that is spreading like Martian weed. A small but noticeable red light reports a powered up status. There are 4 ports on the DPM: USB out, S-Video In, Video In, Video Pass through. As mentioned earlier, the user is left to handle audio through the PC's sound card, but there is a generous allowance of cables included with the DPM. : 1 4 ft S-Video, 1 video, 1 6 ft USB (also funky translucent blue), and 2 minplug-dual RCA cables for audio. The manual covers 4 models, and was accompanied by specific enclosures related to USB installation (a 2 minute no-brainer), and some manual errata corrections in the manual specifically related to the DPM. Tucked in the manual were two CDs. Ulead's Photo Express occupies 1 CD. (That figures, as the Dazzle Control Panel has that Mr. Roboto Ulead look to it - Very different, very Metallica). The Dazzle CD included Dazzle Control and Panorama, an app who's only apparent purpose is to create a screensaver from whatever sweeping video you feed it. The Best Buys where I bought the DPM had several on the shelf. A couple of the boxes depicted a white DPM, rather than the translucent color, and had a V3 on a sticker affixed to the box. The translucent had a V2 sticker. Aha! Nothing like a rev level change. A quick call to Dazzle Tech Support brought the explanation: no technical differences, just production run ID. The V value does not appear anywhere on the DPM itself. While talking with Tech Support, I asked about the missing software that the Dazzle web page promises but isn't actually included in the box. DPM was originally intended to be a parallel port device, but when the design was shifted to USB, there was no need to include the software. USB = Win98. Win98 includes the Netmeeting and IE software. Nobody told the web page designer that the software had become unnecessary. In summary, another TRV900 accessory enabling a handy use for the camcorder, high quality video conferencing imagery for $100. I never intended that my TRV900 Video Conferencing project be anything more than a low-cost remedy for the lack of video conferencing software support for streaming DV. 15 hours of playtime have caused me to spend just a bit more than the $100 I paid for the Dazzle DPM. Netmeeting 3.01 is a free vidcon application that allows to callers to exchange video. It does what it is supposed to, using an almost too simple interface. It was ok, but my little dream of having a weekly family video conference required that I look at a multi-user product that kept popping up in video conference posts around the net. CU-SeeMe is a product that started out in 1993 as a project by Cornell University, and was commercialized about 3 years ago. I downloaded a 30-day demo of 3.21, and within 30 minutes knew I would buy it. The setup and interface tools are effective and logical, the audio and video tuning Assistants (MS calls them Wizards) are foolproof, and the squelch control, which establishes an audio transmission threshold so that backround noise does not eat up bandwidth, works very well. A little research on the CU-SeeMe corporate homepage (www.cuseeme.com) revealed that version 4.01 was the current release. The CU-SeeMe application comes in several packages, including a nice promo bundle direct from White Pine for $99 that includes camera and the CU-SeeMe Pro software. I decided I just wanted the software, as the site brimmed with FAQs and other user tips. White Pine quoted me a price of $69 for the software download only, a savings of $31 over suggested retail. Direct purchases from the publisher are not always a good deal, so I opted not to buy from White Pine until I checked the local computer stores. Good for me! The complete retail bundle, docs and CD, were $71 from CompUsa vs the White Pine Direct price of $99. I ended up paying $71 with tax for the CU-SeeMe Pro bundle, which permits up to 12 video users, side room chatting, concurrent file transfers, enahanced tuning features, and a whole range of support services. A tap on a user's video window reveals his or her IP address in the event you want to break away and go one-on-one in a new call direct to another user.